Gold technicians are likely feeling woozy these days—just try and find a trend line to rely on. Up, down and all around, recent gold charts are starting to look like they were drawn by a drunk. Gold's short-term charts have been trending down again and look somewhat bearish. The 3-month bullish up-trend from the June 28 $1,179.40 gold futures low—topping $1,400 late in August—now teeters close to August's low $1,271.80 support as it completes a bearish Head & Shoulders (H&S). We all know the yearly chart will be down unless there's a yearend golden miracle—it's first annual drop in 13-years—with gold's 2-year price now down over 31% from its 2011 $1,923 all-time high. Zoom out and gold looks totally different. 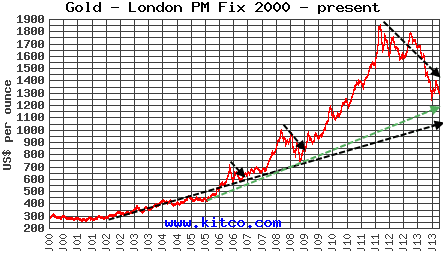 From $260 in 2001 to its 2011 all-time high, gold's long-term chart is a fairly smooth and consistent rise—however you will see two bumps in the road in 2006 and in 2008 with significant corrections of 22% and 29% respectively. Still above its long-term trend-lines, I see no reason technically or fundamentally why gold can't recover again to even higher highs. Instead of a bearish 3-month H&S, others look back to the sudden $200 sell-off in April and see a bullish inverse H&S completing soon. The shape of the former charts seem more regular, while this chart's volume pattern may be more important. That's why technical analysis is considered subjective, although both H&S perspectives consider the August low gold price support a key level to hold. As markets do often overshoot their trends, the sobering conclusion might be that even if gold retests $1,200, now or going into yearend tax loss selling season may be the time to Bottom Fish gold mining stocks. This is more about fundamental all-in costs, as most gold producers can't make money below that level. Many have already lowered forecasts and as they say the cure for low prices is low prices. I also find support in knowing that the $850 1980 gold high works out to over $2,500 in today's CPI Adjusted dollars—with a whole lot more than three times as much fiat money around now. We also haven't seen a parabolic gold price spike yet—like we saw at the end of the 1970's gold bull market. Monthly statements are an afterthought, and I don't always have time to login somewhere to track how my stocks and potential trades closed that day. One quick, easy and free solution is to signup at our website to set-up your personalized portfolio and watchlist. After logging in, look under our My Preferences tab, select My Watchlist & Alerts, and edit the sample stocks and price alerts the way you want them—under the Action column. Your watchlist is automatically emailed after any price alert is triggered—or select to also have it emailed after the markets close every weekday, or just on Friday's. Below are 35 of the gold stocks on our bottom fish radar—filtered since late June's gold price low, for our homepage's Mid-Day Market Movers section and for our daily Hot Sheet then, and later in our Weekend Recap e-newsletter that is also posted at our website and to our syndicated News Blog. Most of these small to mid-cap gold companies have established resources with producing mines or one in development. Notice how several of them have recently completed financings at prices higher than their current share price—some are even trading at or below their cash value! Stocks are listed in descending order from the largest to smallest by market cap. Each includes its ~2-Year High, 52-Week High, 52-Week Low, Current Share Price and Market Cap. Ticker symbols and company names are also Quote Links for further research or to comment at our website. There's also a brief company description with the recent news headlines that caught our eye at that time. - with ~$38M cash continues to intersect high-grade gold at its Borden Gold Zone, plus 100% of the Black Creek chromite deposit also in Ont. - 3 wholly owned, multi-million oz. plays in the Timmins Gold Camp, Solid Q3, Completes Mill Exp., 3K+ TPD Prod. - bringing its 75% owned Serra Pelada Gold-Platinum-Palladium Mine to production, Completes C$37.95M Bought Deal Financing: $.75/sh. - Drills 133m 1.28 g/t Au (30.5m 3.24 g/t Au) +Ag at Bolo in Nevada; Options 50.01% of Montagne d'Or Au Project Valued at $30M Min.